Neil Taylor was sent off for his challenge on the Ireland-Wales game. 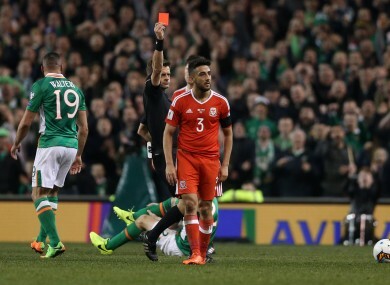 FIFA HAS OPENED proceedings against Wales defender Neil Taylor following a horror challenge that saw him sent off in last Friday’s Ireland-Wales World Cup qualifier at the Aviva Stadium. The tackle resulted in Ireland defender Seamus Coleman suffering a double leg fracture, with the Everton defender set to be out of action for the foreseeable future as a result of the incident. Red cards for violent conduct incur an automatic one-match ban, though Fifa’s latest move has opened up the possibility of the Wales defender’s ban being extended to three games depending on what referee Nicola Rizzoli puts in his post-game report. Should it be extended to three games, the ban, which only applies to international matches, would see Taylor miss Wales’ upcoming games against Austria and Moldova, in addition to the Serbia encounter in June that he was originally suspended for. The Irish camp have not estimated a date for Coleman’s return, though the player is not expected to be available for the remainder of the Boys in Green’s World Cup qualifying campaign, with a return to action before 2018 unlikely. According to The Independent, a Fifa hearing that will decide Taylor’s fate is likely to take place within the next two weeks. Email “Fifa open proceedings against Wales' Neil Taylor after Coleman horror tackle”. Feedback on “Fifa open proceedings against Wales' Neil Taylor after Coleman horror tackle”.